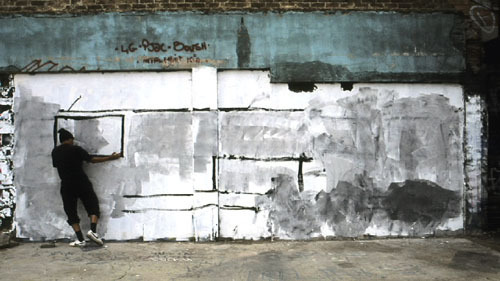 Robin Rhode, The Stripper, 2004, still from a digital animation, 2 minutes 22 seconds. Featuring some twenty works from the past decade, this will be Robin Rhode’s largest solo exhibition in the US to date. A striking new installation will fill the museum’s lobby, but the show’s focus is the young South African artist’s distinguished work in photography, film, and animation. These pieces, tinged with a sly, lyric humor that recalls silent-film classics, portray individuals, often Rhode himself, interacting with drawings crudely rendered on streets and buildings. Two hands in the photographic suite Snake Eyes, 2004, for example, mime rolling a pair of dice drawn in chalk on a sidewalk curb behind them. Rhode adopts the role of trickster enamored with the fragmentary transcendence offered by illusion; such sleights of hand are linked to the artist’s deeply personal meditation on the slippery struggle for social justice within his native country. 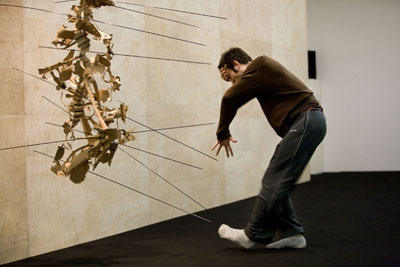 William Forsythe, Monster Partitur, 2008. Choreography and dance have never been synonymous for William Forsythe: Film, language, and architecture are at least as important to the structure of works like Kammer/Kammer, 2000, as bodies are. Such a genre-defying approach is now standard fare—yet another trend Forsythe set. His influence on ballet (where his roots lie) and beyond cannot easily be overstated. This show, aptly subtitled “Transfigurations,” includes four video installations made between the mid-1990s and the present, along with Synchronous Objects for One Flat Thing, reproduced, Forsythe’s new interactive Web project developed at Ohio State University. But don’t worry, the choreographer hasn’t abandoned the body: Within the gallery space, he will stage the US debut of his installation-based performance Monster Partitur, 2008, a companion to his devastating portrait of mortality from 2005, You made me a monster.